The Desert Lynx strives to offer the insider perspective into current events and cultural trends. Internationally-read, published in several different outlets including the Western Center for Journalism, Doublethink Magazine, the Future of Freedom Foundation. Want the whole picture? Youve come to the right place. Dont trust the official story. Get the picture from behind enemy lines. 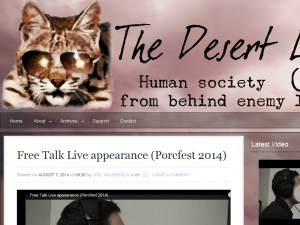 This what your The Desert Lynx Blog Ad will look like to visitors! Of course you will want to use keywords and ad targeting to get the most out of your ad campaign! So purchase an ad space today before there all gone! If you are the owner of The Desert Lynx, or someone who enjoys this blog why not upgrade it to a Featured Listing or Permanent Listing?